Prepare the beef cheeks: season beef cheeks with salt and pepper a day before service, cover it and refrigerate it for 24 hours. This step is not essential if time doesn't permit but by doing this, it will ensure an even seasoning throughout the meat. Remove the beef cheeks from the fridge. Heat 2 tbsp of vegetable oil on high in a heavy frying pan, then add the beef cheeks to the pan and sear on all sides. Once seared, transfer the beef cheeks to a casserole dish and leave it aside. In the same heavy frying pan, heat another 2 tbsp of oil and fry the garlic, onion, carrots and celery over a moderate heat until caramelised. Add the red wine, Madeira or port and 2 bay leaves to the pan, stir well and simmer until the liquid has reduced by half. Once this is done, add the beef cheeks, beef stock, and passata or diced tomatoes and bring to the boil, skimming off any scum on the surface of the liquid. Switch off once it's boiled and transfer all ingredients into a casserole dish, cover it and place it in the middle of the oven for 3 hours or until tender. Grab a small bowl and add 1 ladle of stock from the simmering stock and saffron threads together. This will infuse the saffron. Leave it aside. While the stock is simmering and saffron is infusing, melt 4 tbsp of butter and olive oil in a large saucepan until foaming. Then add onion and garlic and cook it gently for about 3 minutes, stirring frequently, until softened. Add carnaroli rice in the saucepan, stir until all coated (3-5 minutes) and then add white wine, stir until all wine is absorbed. Then add a few ladle of stock with the saffron liquid and season with salt and pepper to taste. Stir constantly until stock is absorbed. Add the remaining stock, two ladlefuls at a time, allowing the rice to absorb all of the liquid before adding more. Keep stirring constantly. After 20-25 minutes, the rice should be al dente and risotto should be golden yellow, moist and creamy. Take it off heat and gently stir through two-thirds of a cup of the grated parmesan cheese and the rest of the butter. Stir through until butter has melted, then taste for seasoning. 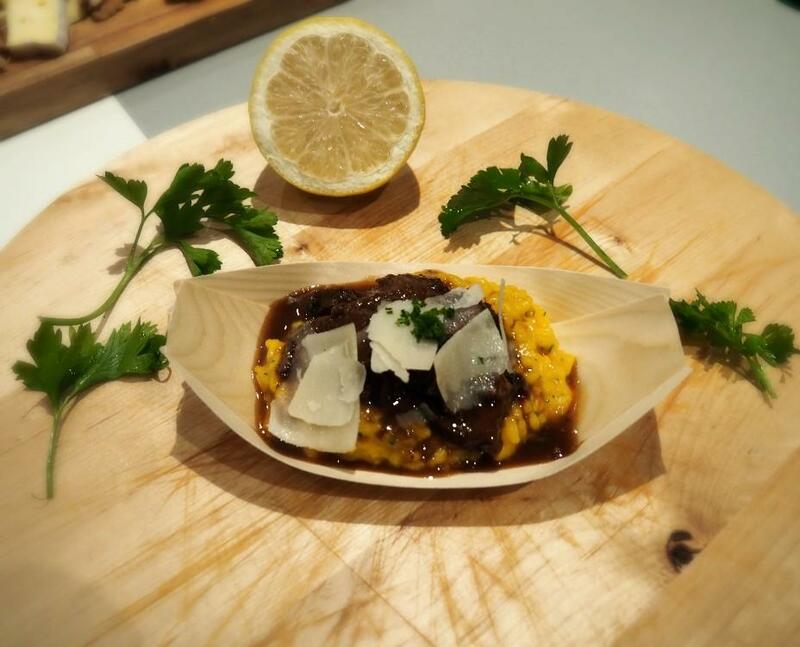 Immediately serve risotto onto a warmed serving bowl or platter with braised beef cheeks on top, drizzle with a generous amount of beef cheek's sauce. Garnish with the remaining grated parmesan cheese and parsley if desired. Shave parmesan cheese is also an option for garnish. Serve it immediately and bon appetit.